« Garbage Truck Goes Up in Flames on Empire Blvd. After spending more than a week on the run, the Kutsy family has been located, and after negotiating with authorities they have turned themselves and their children in. The kids were taken to a hospital for evaluation and are reported to be in good health B”H. 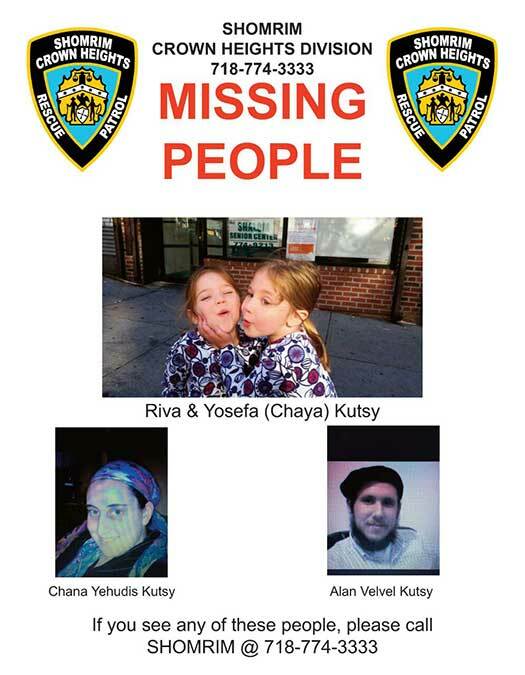 This good news comes after Shomrim and the NYPD have mounted a multi-state search for the missing family, who has been on the run since last week Saturday, January 31st. There are unfortunate circumstances surrounding the case, which has seen the involvement of New York City’s Administration for Child Services removing the children from the parents’ custody in the past. They have recently been reunited – on a trial basis – with their children. “When the parents left the city without properly notifying ACS they violated the terms of their temporary custody agreement” detective Raymond Weng said. The couple was scheduled to appear in family court for a mandatory hearing on Thursday, February 5th. After skipping the hearing concern for the family mounted and ACS filed a missing persons report with the NYPD. The search went public Sunday afternoon after authorities reached out and requested that anyone with information regarding the whereabouts of Allen Velvel Kutsy and his wife Chana Yehudis Kutsy along with their two children Riva (4) and Yosefa Chaya (3). 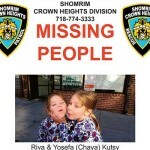 Missing persons posters were distributed by Shomrim and Wanted posters were given out by the NYPD. Shomrim logged hundreds of calls on their hotline with tips from people offering a wide array of information. Shomrim relayed the information to the NYPD detectives working the case in real time, which ultimately lead police to locating the couple and getting them to turn themselves in. Baruch HaShem they are safe and sound. 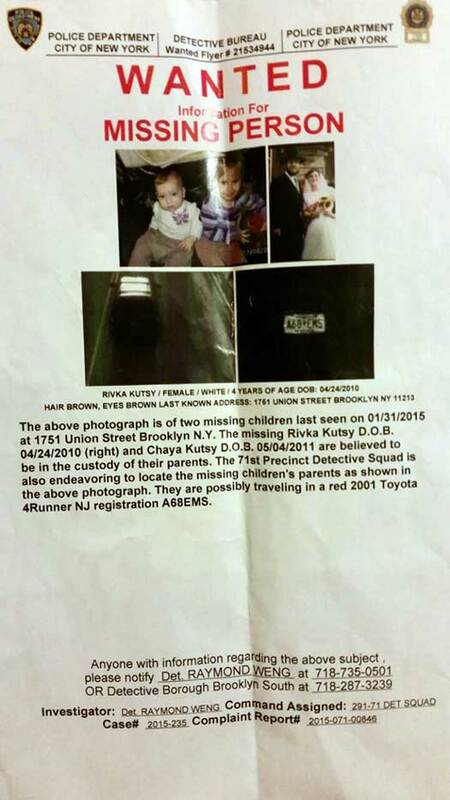 Yosefa and Riva I hope you are returned to your loving foster family and will be able to forget all this turmoil. BH BH the tefillos really helped, everyone! Thak G’d they’re safe. There will need to be a lot of healing for those children. I want to know what the consequence will be to the father. And if he was found and what measure will be taken to make sure the wife will not be stalked or found at home by husband. Anyone know any other details? If the husband is still on the loose can’t he just go home and continue his abuse. Chas v shalom but could happen. Is she going to a friend’s house ? Yes, these things you mention are important to be taken care of, but these details do not need to be made public for everyone’s eyes. Now we have to make sure that abusive, perverted monster never looks st the looks again. Next time we may not be so lucky. Congrats of finding them, thank god, where did u find the kids? I cry for the wife!!! what a miserable life got!!! hope she can divorce him and start again ….. some times is divorce a must!! She actually divorced him once -and remarried him the next day! She gets restraining orders and then violates them herself. She is unfortunately a very ill woman and must not be allowed to ruin her beautiful children. Every organization and activist in CH has tried helping her, but you can’t save a person from themself. I am very impressed that Gadi Hershkop has seen this through. Hashem will bless him for that. What is the whole story?! While my heart breaks for any mother who is a victim of abuse, she is just as incapable of looking after those children as he is, but she stuck with him. I hope she gets help & support, but I also hope the children are never returned to her. She is not well herself. The foster home they were in before someone decided the birth parents could look after them properly (clearly not) was just the kind of home they need – frum and loving. I hope they go back there. Maybe people should wonder what if their children would be taken and given to other families, how you feel. It’s understandable that these parents did this since many other parents would due the same if they were parents and loved their children too much. At times some parents can’t look after their children, bu t who gave the authority to others to remove the children from a parent, who says they would better off anywhere else. In this case, the kids thrived in foster care, thanks to the wonderful family who took them. Sometimes the situation is just too difficult and the people involved just not capable of taking care of themselves and/or their children. Never simple or easy, so let’s not all be backseat choreographers and say what should be done. Why don’t they just put the kids into a foster home? I know lots of foster homes NYC, brooklyn, bronx, harlem, and there are even a few in Crown Heights. No kid deserves to live that way with their father! So sad to rip apart a family like that! Playing with fire to take children away from and estrange them from their mother and father. Foster home among non Jews is the end of yiddishkeit. Let us have more frum people volunteer for fostering! I know some wonderful frum couples who are unable to have children. Perhaps they would like one of these lovely girls. Who are you to talk like these children are a possession and that someone might like one. It’s not good this Loshen Hora here, but thank you anyways as someone going through it and feeling isolated. I didn’t hear about it in frum community til now. ב״ה they are safe. Tehillim for all involved to get the help they need. May we only hear good things. Hey, I have a better idea.How about YOUR kids go live with this man and these parents so they’ll feel safe and nurtured. Are you fools for real???? I think in any foster care situation, siblings should always be together.There are wonderful families willing to keep these children and give them a life they deserve with stability, a future and an environment to thrive.Not all families can provide this. it very “nice ” that all people use to say, that public should do not knew, but it’s public now. so how i can understood what happen? authority can make mistake too, especially democrats? There is no excuse to embarrassing these parents. it’s not useful and publicizing this didn’t help at all in locating the parents. This story is just entertainment for all the nosey and curious lubavitchers. It is not a given that the Courts just take away the children and place them in foster care. There are many extenuating circumstances and it takes a lot for the children to be placed with people outside of family. These agencies look first to place with kin. Only if this is not possible, then they are sent to be fostered with others. The goal of ACS is to reunite the family eventually and to keep siblings together. Although it may not seem like it, parents have ample opportunity to go to classes, etc and learn how to take care of their children ready for reunification. The process is long and stressful. In the meantime, the kids have as much stability as possible. For children to be in an abusive home (even if they themselves are not physically abused) the emotional toll is devastating. Unfortunately, i doubt that after this fiasco, these children will ever be placed with their parents again. Sadly, parents are not always the best place for children to be. The Courts, social workers, psychologists, law guardians and other professionals will look for what is in the best interest of these children. Now it is time for the children to feel safe and to heal. Good job detective weng……. did he replace Det. Vinny because I do not see him no more? We would like to thank Inspector Fitzgibbon, Community Affairs Officer Bulzoni and the one and only Det. 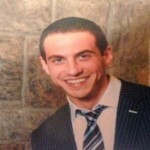 Vinny for working behind the scene on this case and for always being there for Shomrim whenever called upon. If someone insults someone and they do not respond, they can give brochos. The lashon hara about this situation must be affecting you tremendously. May Hashem heal thesituation in a way that you can handle and what is best for the children. I am surprised how so many of you can call foster care a safe and stable place for children to grow up. I know that some times it beats the alternative. I don’t know this story, but I hope for these children’s sake the mother gets the help she needs, because know child should have to grow up in foster care. It seems to me from what I have read so far, that the mother of these beautiful girls has no support system. If her children are being placed in foster care and not with family. It is very hard for a women to leave an abusive husband, especially when she has no where to turn. 1) cps can remove a child with out any evidence if it deems it necessary, then there is a hearing… by a government court that is heavily partial to the governments case. any hearing is unfair and biased, unless the family has significant financial resources. 2) cps receives a larger budget from federal government for each child in its custody, they have an incentive to remove children. 3) the child’s best interest is always to remain with the parents regardless how abusive the parents may be, removing a child from family causes emotional scars that never heal. 4) too often children are removed from parents for trivial reasons, or based upon rumors or confidential information of which you are not allowed to confront your accuser in court…. 5) i don’t know for sure but i doubt that the government went out of their way to in the slightest to put these children in a Jewish foster home let alone a frum foster home, even thought there is an organization that tries to place Jewish children with Jewish foster parents. as a child i was in over 45 foster homes, and 15 to 20 group homes, residential settings ect. I was made an orphan by the court, suffered physical, sexual, and emotional abuse you couldn’t imagine. you think you did a good thing, all you did was victimize a couple of little girls. You sir (or maam) are an evil and vile person. Lets ignore all your babble and cut to the heart of it. The kids are with a FRUM LUBAVITCH foster family right here in Crown Heights. A family whom they spent more then three years before they were returned to their biological parents on a temporary basis. They screwed that pooch and decided that instead of following the rules that had been set out for them they would rather go on the run… The actions of clear thinking rational adults, right? It would funny, were not so sad, to read your tin-foil hat conspiracy theories. Unless you are a parent who abused their children and had them taken away by ACS and decided to blame everyone but yourself. Gimmy’ a break and go spew your drivel elsewhere. People with brains reside here. Too much lashon hora. I do not know any of the background info; nor do I care to know. It is not my business nor is it the business of most of those who posted. Boruch HaShem the children are fine. IYH they will be returned to the loving foster family where they apparently were thriving. End of story; no more details need to be shared. 1) i don’t have any kids, nor do i want to. the last thing i want is to give the state another sword to hold to my throat. 2)B”H the children are in a Jewish foster home. this is not always the case. 3) incentives matter, and government agencies have unique incentives created by policy and law that shape their character. good intentions differ greatly from good results. 4)as far as the father being a deviant, all i know is g-d is the true judge. Just a guess but Drugs, the scourge of our time must be involved. You must know this because somebody told you that somebody told him, first hand. i see only “nosey and curious lubavitchers. What language is this comment written in? Totally agree with you.42 needs some medication badly or he/she is an abuser.Otherwise something that insane and despicable would not have been written.Better to be abused? Is this an animal who wrote it? 42 makes very good and true points. He’s wrong about his/her point #3, but probably misspoke and overgeneralized. 90% of what (s)he writes is factually correct. I’d imagine that this case doesn’t fit that bill and that the children were in danger. But it’s also clear that the state has removed far too many for insane reasons and that the amen chorus on this board, including the people who viciously and personally attacked 42 for speaking the truth could care less about those cases. So… I have no idea about this case. Do half of the commentators yenting on here know anything about it? Semi-literate (that being extremely charitable) loons posing as neighbors get a total pass on their barely legible graffiti, but #42 gets attacked for sharing his or her experience and first hand knowledge. You claim that #42 needs medication. You also question whether he/she/it is an animal. Can you explain what this medication is, what condition its for, and what criteria you’ve used to reach this conclusion? Are you a physician? If you are, do you drug all your patients? are all your victims treated as numbers, such as #43, #42, “animals”? I teach my children that Leftists and Liberals like you are the biggest danger to society. This information is littered with lashon hora. I too dont know any of the background info; nor do I care to know. It is not my business nor is it the business of most of those who posted. 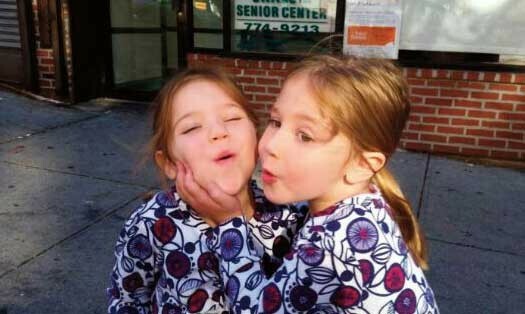 Boruch HaShem the children are fine, even though they were never technically “missing.” IYH eventually when they grow older, they will seek out and return to their true parents, who loves them deeply. Hopefully they will forgive the foster parents, who mean-well, for keeping the family apart. Cani is a friend of mine and she always spoke well of the foster parents who were supporting the kids returning home. Say whatever you will about ACS and Ohel ( not disagrreing with alot of the comments) but as Im aware the foster parents only became foster parents after the kids were taken away becuase no family in crown heights came forward to help. please dont bash them.. REALLY!!!! I wasn’t thinking when I spoke out against foster parents I don’t even know. You are correct, Cindy. ACS and Ohel are the real problem, since their loyalty to legal obligations and reporting requirements come first, even before those they are trying to help. When that happens, and a family steps up to the plate to take in these children, caring for them as their own – I should be humbled before them, and I feel like a fool after speaking the way I did. Ultimately the real problem is with us as a community. Had we been looking out for each other like true chasidim of the previous generation, there’d then be no need for organizations such as Ohel and the ACS. Our community did try to help the family in many ways, over many years. The children will not feel that the community neglected them, as many efforts in many areas were attempted. Unfortunately, sometimes a family needs more help than can be provided and/or cannot m’kabel the assistance offered. There must be a kayli that can accept and work with the assistance offered. The husband in this situation was never able to get it together. And didn’t seem interested in changing anything. Let’s stop judging and philosophizing and just pray that the entire family gets the help that they need. I dont know the foster family personally but my sis in law is good friends of there’s and attests to the chesed they have done for these children. They have opened their homes to them and others and have provided them a safe haven. No they may not be their mommy and tatty but at least they are being cared for loved and kept safe. I don’t know any of these people. But for the sake of these two little girls please stop this thread. When they grow up they should not know that all these strangers were talking about them and their parents. Let them have their privacy and get healed. Perhaps there is a better soap opera online you can watch?